"Gongylodes" redirects here. For the moth genus, see Erechthias. Kohlrabi (from the German for cabbage turnip; Brassica oleracea Gongylodes Group), also called German turnip, is a biennial vegetable, a low, stout cultivar of wild cabbage. It is the same species as cabbage, broccoli, cauliflower, kale, Brussels sprouts, collard greens, Savoy cabbage, and gai lan. It can be eaten raw or cooked. Edible preparations are made with both the stem and the leaves. Despite its common names, it is not the same species as turnip. The name comes from the German Kohl ("cabbage") plus Rübe ~ Rabi (Swiss German variant) ("turnip"), because the swollen stem resembles the latter. Kohlrabi is a commonly eaten vegetable in German-speaking countries and American states with large ancestral German populations such as Wisconsin, but is also very popular in the northern part of Vietnam where it is called su hào, and in eastern parts of India (West Bengal) and Bangladesh where it is called 'Ol Kopi'. It is also found in the Kashmir valley in Northern India and is there known as 'Monj-hakh', 'monj' being the round part, and 'hakh' being the leafy part. This vegetable is called 'Nol Khol' in Northern India, 'Navalkol' in Maharashtra, 'Navilu Kosu' in Karnataka and in Sri Lanka as 'Nol col' (the Turnip Cabbage). It is also native in Cyprus where it is known as 'kouloumpra' ("κουλούμπρα"). 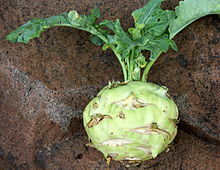 Kohlrabi has been created by artificial selection for lateral meristem growth (a swollen, nearly spherical shape); its origin in nature is the same as that of cabbage, broccoli, cauliflower, kale, collard greens, and Brussels sprouts: they are all bred from, and are the same species as, the wild cabbage plant (Brassica oleracea). Except for the Gigante cultivar, spring-grown kohlrabi much over 5 cm in size tend to be woody, as do full-grown kohlrabi much over perhaps 10 cm in size; the Gigante cultivar can achieve great size while remaining of good eating quality. The plant matures in 55–60 days after sowing and has good standing ability for up to 30 days after maturity. The approximate weight is 150 g.
There are several varieties commonly available, including 'White Vienna', 'Purple Vienna', 'Grand Duke', 'Gigante' (also known as "Superschmelz"), 'Purple Danube', and 'White Danube'. Coloration of the purple types is superficial: the edible parts are all pale yellow. The leafy greens can also be eaten. One commonly used variety grows without a swollen stem, having just leaves and a very thin stem, and is called Haakh. Haakh and Monj are popular Kashmiri dishes made using this vegetable. In the second year, the plant will bloom and develop seeds. Kohlrabi also comes in three different colors: white, purple, and pale green. Kohlrabi stems (the enlarged vegetal part) are surrounded by two distinct fibrous layers that do not soften appreciably when cooked. These layers are generally peeled away prior to cooking or serving raw, with the result that the stems often provide a smaller amount of food than one might assume from their intact appearance. The bulbous kohlrabi stem is frequently used raw in salad or slaws. It has a texture similar to that of a broccoli stem, but with a flavor that is sweeter and less vegetal. Kohlrabi is an important part of the Kashmiri cuisine where it is called Mŏnji and is one of the most commonly cooked vegetable along with collard greens(haakh). It is prepared with its leaves and served with a light soup and eaten with rice. Some varieties are grown as feed for cattle. ^ "Vegetable Dictionary - Kohlrabi". extension.illinois.edu. Retrieved 2016-05-09. ^ Ghosh, Ushnish. "OL KOPI (Nool Kol, Ganth Gobi, Kadam, Kohlrabi) WITH GREEN and PANEER (PUNJABI & KASHMIRI)". 8 December 2010. ushnish.blogspot.co.uk. Retrieved 11 May 2017. ^ "OL KOPI – KHOLRABI TORKARI". masalatize.com. Retrieved 11 May 2017. ^ Pandita, Anjali. "Monji Hakh". 22 December 2012. kashmirifood.com. Retrieved 16 May 2017. ^ "Knol Khol F1 Hybrid - Seeds". nurserylive.com. Retrieved 11 May 2017. ^ "Kohlrabi Recipes - Navalkol subji". ^ "Κουλούμπρα, Κούρβουλα". Cyprus Food Museum. ^ "Kohlrabi Is Weird! And Here's What You Can Do With It — Ingredient Spotlight". The Kitchn. Retrieved 2016-05-09. ^ "Growing Kohlrabi - Bonnie Plants". Bonnie Plants. Retrieved 2016-05-09. ^ "Early White Vienna Kohlrabi". rareseeds.com. Retrieved 16 May 2017. ^ Bailey, L. H., (1912, republished in 1975). Kohlrabi for stock-feeding. In Cyclopedia of American Agriculture: Vol. II--crops. Macmillan Publishing, New York. p. 389-390. ISBN 0-405-06762-3. Google Book Search. Retrieved on June 15, 2008. Wikimedia Commons has media related to Brassica oleracea var. gongylodes. "Kohl-rabi" . Encyclopedia Americana. 1920. "Kohl-rabi" . New International Encyclopedia. 1905.